Zam Zam Chiffon Lawn for Girls collection is the part of Dawood Textiles Summer collection for year 2013 giving you a vast variety for the summer season based on 75 new prints. Dawood textiles is the renowned name of the textile industry of Pakistan and many famous and promising designers of the fashion industry are associated with it. Its trend is to provide you the most amazing prints and best quality clothes for every season and occasion. The products always receive a huge response from general public. The hotness of summer is at its peak. In the blazing hot weather, everyone wants to wear comfortable yet stylish clothes. Zam Zam collection is designed just according to the weather of Pakistan. This year, Zam Zam offers you some of the best dresses of town. The breezy Lawn for Girls collection will let you beat the heat very effectively. The collection is designed to provide you comfortable yet trendy dresses for the summer season. Hence the stuff of the dresses is chosen very wisely. 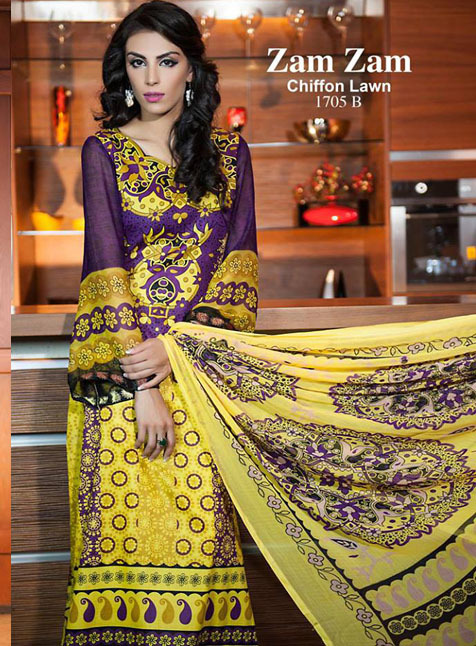 3-piece suits are available in the collection which contain beautiful chiffon dupattas. The lawn dresses are adorned with the most unique and beautiful prints. These heavenly prints are designed according to the tastes of buyers; the prints you have never seen before. Most of the printed shirts have beautiful printed borders that further beautify the overall look of the dress. 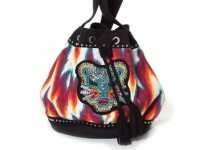 These dynamic prints are adorned with the most refreshing and attractive colors. Bold and sharp colors such as red, blue, green and orange give an absolutely stunning look to the dresses. Chiffon dupattas are also adorned with beautiful prints and colors to match with the shirts. Shalwar are mostly plain that look really good with the dresses. The shirts are beautifully adorned with gorgeous laces. These dresses will definitely give you an amazing appearance since they are designed keeping in view the latest trends and fashion. The best part of the collection is that the best quality materials are used to come up with the collection which is very close to perfection; and that is why these dresses are being liked very much in the market by the local customers. The ready to wear collection of Lawn for Girls will give you the most classy look in your friends circle. The clothes provided in the collection are perfect in every sense; they are designed according to the latest trends and fashion, they are funky yet elegant, stylish yet comfortable, stunning yet affordable. And so the brand is being highly appreciated by the buyers in the market. All the designers have worked really hard to give you the latest summer collection. The beautiful dresses are a treat for the young ladies who want to look trendy and stylish while maintaining a traditional look. The aim of the Zam Zam lawn chiffon collection is to provide trendy clothes which also carry the delightful tradition essence. The collection will effectively solve your clothing needs. Whatever the occasion is, you can always dress yourself up with the Zam Zam collection of Lawn for Girls.